Glass has been used since Roman times for windows and since medieval times for decorative purposes. Initially glass panes were small and irregular in thickness. During the industrial revolution the technology for the manufacture of large panes of sheet glass of uniform thickness was developed; ultimately giving rise to the extensive use of glass as an architectural material. 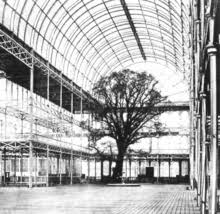 The first and very impressive example of glass used in architectural applications is The Crystal Palace (opened in 1851). The next substantial development was in the late 1950’s, when Alistair Pilkington produced the first ‘float’ glass. Towards the latter part of the 20th Century further technological developments were made in sheet glass manufacture and also in building construction that allowed sheet glass to be used in structural applications to form the external walls of large buildings and skyscrapers, as illustrated below. Today, sheet glass can be manufactured in a number of ways, such as: annealed, heat strengthened, toughened (tempered) and laminated; depending upon the application. In addition, the composition of the glass can be tailored to reduce heat transmission e.g. solar gain (the greenhouse effect) or heat loss. Coatings can also be applied to glass windows to modify light and heat transmission and even make them ‘self-cleaning’. Changes in both bulk chemistry and surface condition affect the way in which the glass responds to changes in temperature, i.e. thermal expansion and contraction, which in-turn influences the thermal stresses imposed on the glass sheets. Associated with the rapid development and exploitation of sheet glass, as a building material, has been the greater rate of fractures and the associated costs of replacement units. The causes of such fractures depend on a number of factors, including the type of glass involved, its method of manufacture and where it is installed. 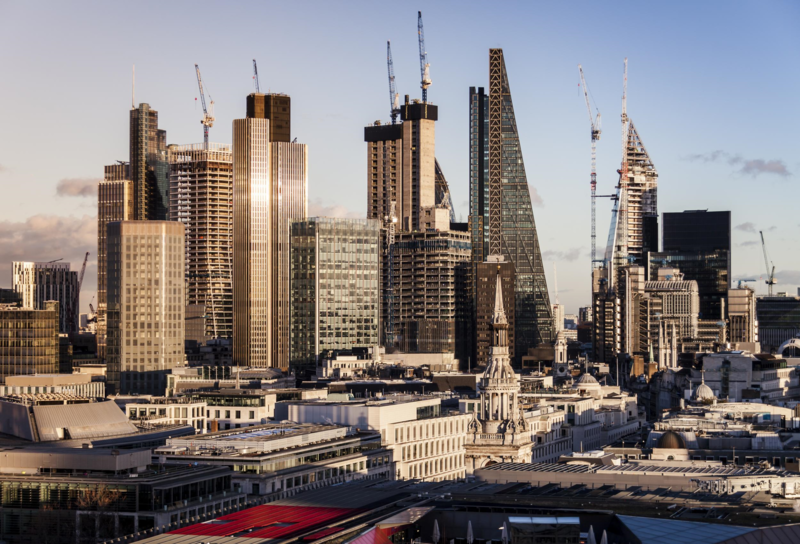 Although modern glazing units are relatively inexpensive the cost of replacement is often considerable, given they are often installed in relatively inaccessible locations in congested cities; often requiring road closures and the use of cranes or other access equipment to replace them. 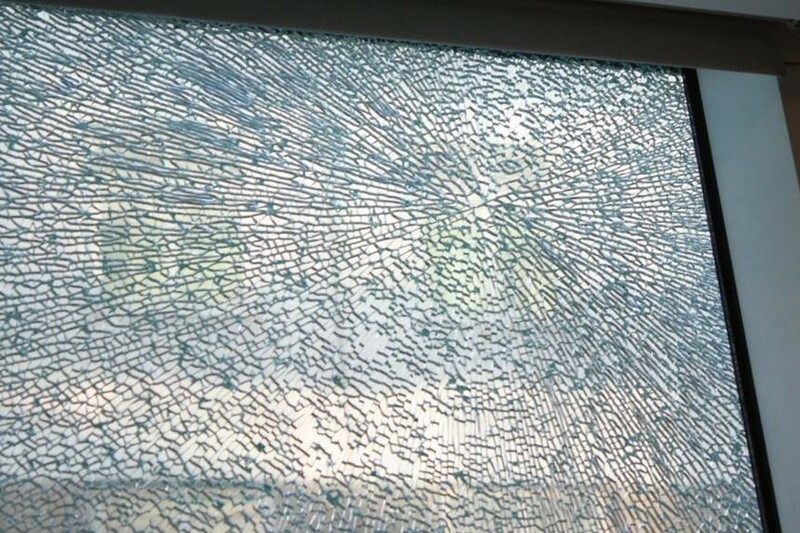 The main causes of fracture of glass panes are, in no particular order: 1) Thermal stresses, 2) Impurities, 3) Impact damage and 4) Edge damage. Thermal stresses can arise in annealed glazing panels due to differential expansion or contraction that takes place between one region and another. This differential strain can be brought about by a number of factors; such as rapid changes in temperature, partial shading from the sun (e.g. eaves, balconies, or nearby buildings) and shielding of the edges by the frame. Under certain conditions, this differential expansion can generate stresses (strain energy to be precise) within the glass of sufficient magnitude to cause the pane to fracture. Such fractures generally progress slowly, as they are low energy processes resulting in meandering cracks, as illustrated. Factors that influence the likelihood of thermal stress fractures occurring include: 1) the chemistry and surface condition of the glass, 2) the colour of and the type of material used to make the frame (if applicable), 3) the location and orientation of the unit, 4) internal heating/cooling and 5) the condition of the edges of the sheet, which is considered below. Impurities of a particular chemistry occasionally exist in toughened glass that give rise to sudden and spontaneous fractures, which can occur up to approximately 20 years after manufacture. The particular impurity is Nickel Sulphide (NiS) and its existence and effect have been known as far back as the 1940’s. NiS is difficult to detect and to remove, due to the extremely small quantities necessary to cause these delayed fractures. Very small NiS particles (inclusions) form during glass manufacture and are ‘frozen’ in their high temperature, high density crystal structure when the glass is quenched. Over time, the inclusions undergo a phase transition to a lower density (higher volume) crystal structure. These processes develop very high internal tensile stresses within the toughened sheet, which eventually shatters into thousands of cuboid particles, as illustrated. 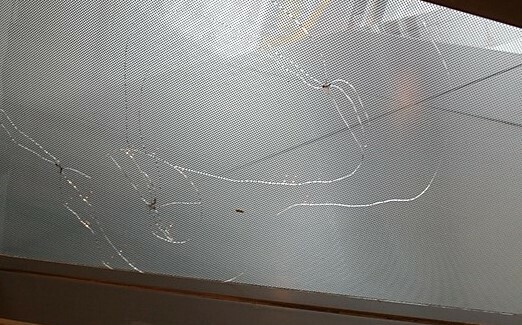 Although the fracture pattern illustrated above is characteristic of what happens to toughened glass containing NiS inclusions, they are often not visible to the unaided eye. Caution should also be applied when making a diagnosis, as other causes can produce the same general effects in toughened glass. 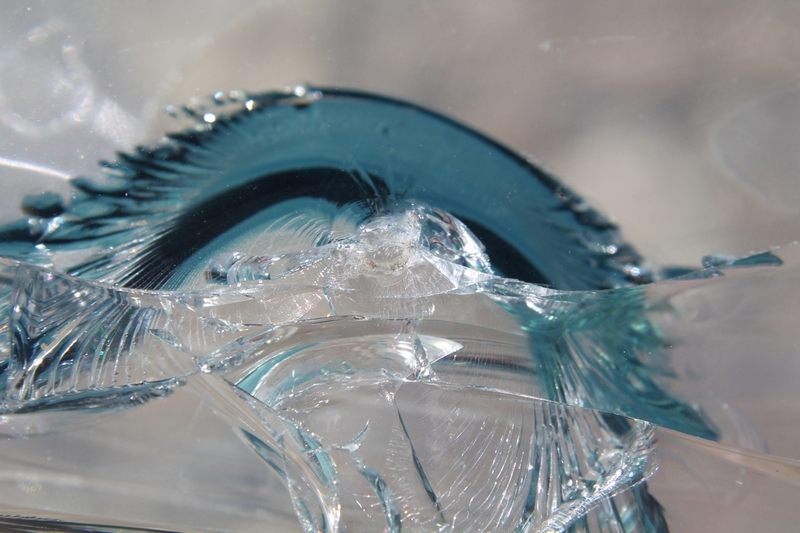 Impact Damage can arise in numerous ways, but each imparts sufficient stress or strain energy into the glass sheet to cause it to fracture. There are two broad categories of impact damage: soft body or hard body. Examples of soft body impact include accidental collision by a human body with an internal pane or a bird strike with an external pane. Soft body impact often leaves no positive evidence of its occurrence. 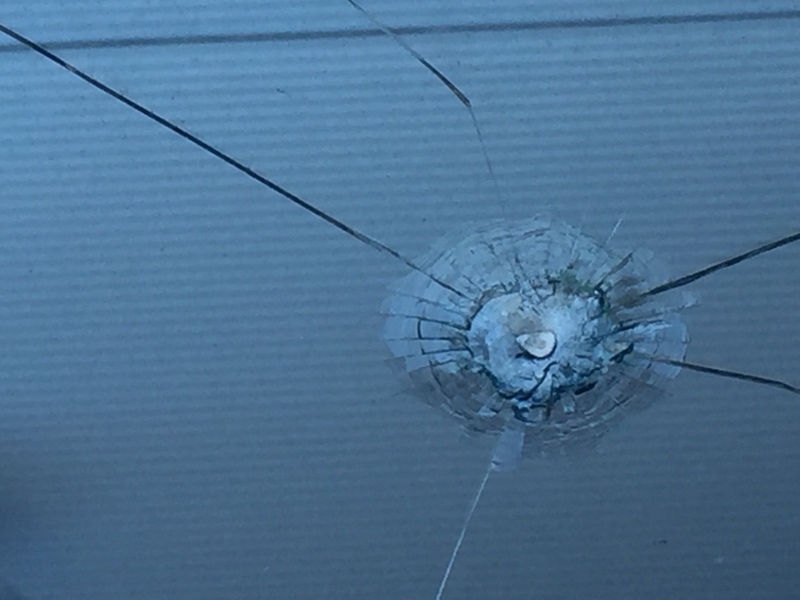 Hard body impact is usually caused by small and hard objects striking a pane and there is often fractographic evidence available to the trained eye to confirm the occurrence of hard body impact. Edge Damage caused during manufacture, transportation and installation results in the generation of latent (crack-like) defects at the edges of panes that concentrate any additionally applied stresses locally, causing fractures to occur that would otherwise not have. In other words, they exacerbate the stresses induced after installation of the units; such as those arising from differential temperatures, wind loading etc. In such cases, it is important to ascertain the proximate cause of fracture, i.e. was it caused purely by excessive latent defects, or by operational stresses that just happened to initiate at a normal edge defect? Although the general and most common factors that have a bearing on the fracture of architectural glass have been outlined above, each fracture occurs under a unique set of circumstances and often with the conjoint action of several processes. Hence a proper and correct diagnosis requires a detailed forensic investigation to be undertaken.